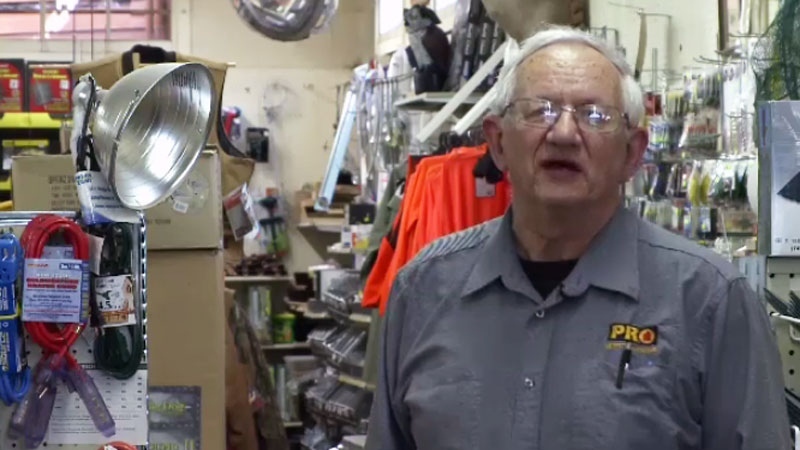 The owner of a small independent hardware store in New Brunswick is taking after his father and grandfather by receiving the Golden Hammer, a 50-year service award. The award recognizes a lifetime of service in the hardware industry. Don Moffett’s grandfather opened Moffett’s Hardware in Sussex, N.B. in 1922. “There has been a lot of changes over the years - computers, tax systems, all sorts of things, but we still try and do business very much the same way as my grandfather did when he started out,” says Moffett. Gary Morris is president of the Sussex Downtown Business Association. He says the success of the hardware store is pretty straightforward. The customers aren’t the only ones who keep coming back to Moffett’s Hardware - some of the employees have stuck around for decades. “The record used to be 22 years for one man, that was when I was a kid and we have passed that, one gentleman retired a few years ago after 35 years,” says Moffett. After 92 years in business, Moffett’s Hardware is up for sale. Moffett says he is looking forward to the next chapter of his life. “I have got decent health, but I am looking forward to doing more fishing, more golfing, cross-country skiing,” says Moffett. Moffett says he has one key piece of advice for any prospective buyer.